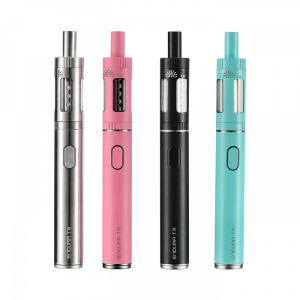 Compact, stylish, and blazing in performance, the Endura T22 starter kit is the perfect kit that does it all simply and effectively. Comprised of the Endura T22 box mod and the Prism T22 tank, both contribute to outstanding vapor production and great usage overall. Remarkably small and slim, the T22 mod that is ideal for on the go vaping. It features a 2000 mAh battery that fires at a max of 14 watts. Paired with the Prism T22 tank, which features a top fill twist design, 4.5 ml capacity, this Pyrex glass tank features the finest in vapor production with its Prism Airflow and organic cotton coil, that provides 1.2 ohms of resistance. The setup is finished off with a delrin drip tip, allowing for a fantastic range of performance, and altogether, results in a user-friendly, easy-to-use starter kit that delivers on both fun and function; get your Innokin Endura T22 Starter Kit today!